Brushing and flossing are vital to having a healthy mouth, but no oral hygiene routine is complete without dental cleanings at least twice a year as part of a regular dental checkup. Dental cleaning is important to keep teeth clean and to help your body maintain oral health. Dr. Wieland uses the latest dental diagnostic technology to identify and stop potential decay and damage at the earliest stages. What is meant by Dental Cleaning and Prevention? Just as you need to look after the rest of your body to look good, so you need to care for your teeth and gums. When your visit your dentist for dental cleaning and prevention treatment, he will examine your teeth fully and usually take a full set of x-rays at the same time; these will allow him to see what is going on inside your gums and jaw bone. What are the benefits of Dental Cleaning and Prevention? Cleaning and polishing: This will remove tartar from your teeth as well as plaque, which is formed from bacteria. If left in place, inflammation will eventually occur. He will then polish your teeth to make them look good, removing stains at the same time. Evaluating your gums: Your gums and the bone underneath your teeth will be carefully checked to ensure that there are no problems or any disease developing. X-rays: These will allow Dr. Wieland to check inside your jaw bone and teeth for such things as bone loss, problems with development, teeth in the wrong position, tumors, abscesses and any other hidden problems. Existing dental work: Dr. Wieland will check all fillings, crowns, bridges, implants etc. for any damage or signs of wear and tear. Dr. Wieland wants to partner with you and your family to ensure that everyone can enjoy a lifetime of good oral health. 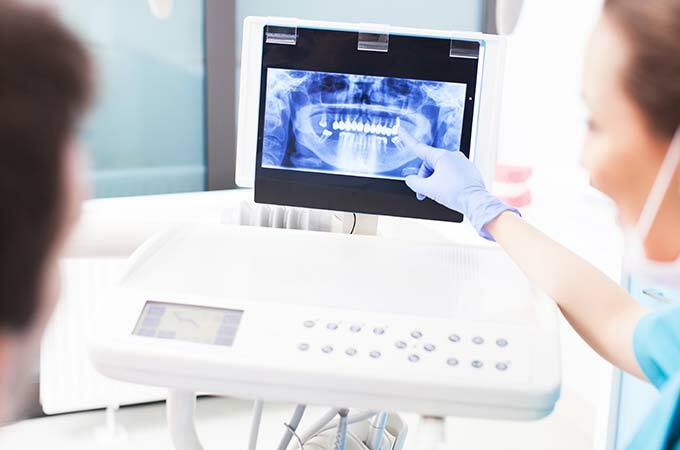 By relying on digital X-rays, Dr. Wieland is able to make precise, detailed images of your teeth that are instantly accessible and offer an easy way to discuss your treatment plan and potential areas of concern. This way, the doctor's recommendations are easier to understand. Should I get an oral cancer screening? Did you know that thousands of people every year are diagnosed with oral cancer? This disease can be devastating and even deadly if left untreated for too long. That’s why diagnosing oral cancer in its earliest stages is so crucial to the treatment process. Dr. Wieland can quickly and comfortably scan for oral cancer as a part of your routine dental check up. The doctor will be looking for any tissue abnormalities that could suggest its presence. Who should consider dental cleaning and prevention? Everyone should consider having dental cleaning and preventative work on a regular basis. Good dental hygiene and detection of any problems early on can help you avoid more serious issues later, such as gum disease or tooth decay. This does not mean that you should not continue to take care of your teeth at home. As well as cleaning your teeth carefully you should always watch out for any signs of inflammation of the gums, damage to the teeth or possible oral disease.